IT’S a fact that as soon as they turn 30, become husbands and fathers, and get financially comfortable, angry young musicians start to mellow out. Midnight Oil’s Peter Garrett swapped political grandstanding for, well, political grandstanding faster than you could say ‘‘pulp mill’’ back in 2004, and even Snoop Dogg, whose career was built on rapping about the joys of marijuana, recently admitted he’d given it up to be a better father. So you’d perhaps expect an almost-40, married father of four like Ice Cube to be a little less angry about the world these days. Think again. ‘‘Do I have an angry spirit? Yeah, I do,’’ he says down the line from Los Angeles. Back in 1987, when the rapper born as O’Shea Jackson formed the now legendary group NWA (an acronym for ‘‘Niggaz With Attitude’’) with Dr Dre, Eazy-E, MC Ren and DJ Yella, anger was certainly a driving force behind Cube’s music. Songs such as F*** tha Police, Straight Outta Compton and Gangsta Gangsta were a loud, raw, passionate call to arms against life in the ghettoes, police brutality and the persecution of American blacks that earned the group millions of fans and shot them to the top of the charts. But the backlash was severe – family and right-wing Christian groups protested outside record shops, their songs were banned from many commercial radio stations, police refused to provide the band security at their concerts, and the director of the FBI even sent their record company a letter of complaint. Cube says they were all missing the point. ‘‘We took a negative and turned it into a positive,’’ he says. ‘‘The negative was what we were seeing and what we were going through. The positive was the fact that we made records out of it instead of doing something violent, doing something ultra negative. It don’t make me angry, cos you know, a lot of people got their own agendas and as long as I recognise what that is it don’t make me mad at all. It’s fairly obvious who the best man was in that fight – even after 20 years, Cube is still on top. He left NWA in 1989 under less than amicable circumstances (for years he and the group traded insults on their respective albums). He’s since established a formidable career as a solo artist, with 10 albums under his belt including the seminal The Predator, which went double platinum. He’s also become hot property in Hollywood, having starred in more than 25 films including Friday, Anaconda and family comedy Are We There Yet?. This year, Cube returned to the charts for the first time in two years with latest album Raw Footage, which debuted at No. 1 on America’s hip-hop chart. With songs like Take Me Away, an ode to Barack Obama, and Hood Mentality, an attack on the US education system, it’s being hailed as his angriest and most political release yet. 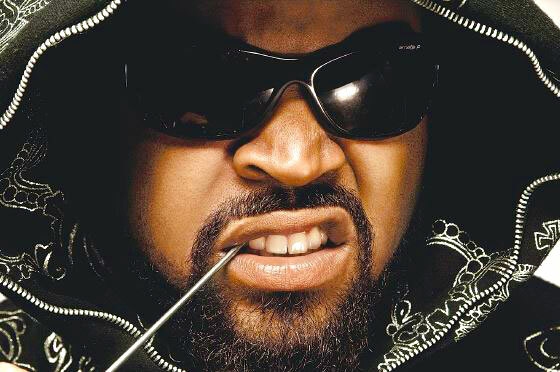 ‘‘I don’t know if I consider it to be angry, it’s just gangsta rap at its finest,’’ Cube says. It’s clear from the first single off the album, Gangsta Rap Made Me Do It, that Cube is pretty mad about the way society views his style of music. With lyrics like ‘‘If I sell a little crack, ain’t nothin’ to it – gangsta rap made me do it / If I die in Iraq, ain’t nothin’ to it – gangsta rap made me do it’’, the song is a scathing attack on the way people blame rap music for society’s ills. ‘‘You know, rap is like a mirror,’’ he says. ‘‘You look in the mirror and if you’re ugly you don’t like what you see. Breaking the mirror is not going to do you no good. And that’s what they do, they look and they see rap and they say ‘Rap is bad’ – why? Why is rap bad? ‘‘Why does rap talk about some of the dirty, gutter things in our society? You know, rap talks about the good, the bad and the ugly in our society, and why? It’s because it’s a mirror and these people have to let it out some way, and that’s the way we choose to let it out. Case in point, he says, is fellow rapper Snoop Dogg being banned from entering Australia last year, and being held up again for a ‘‘character assessment’’ by Australian immigration officials in August this year. 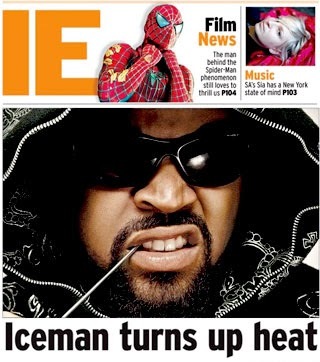 When asked if he feels a duty to fight for the positive representation of rap music, Ice Cube is frank. ‘‘No. I feel it’s my duty to do what I feel when the beat comes on, that’s what I do,’’ he says. First published in IE, Sunday Mail, October 19, 2008.